Spending the majority of time acting ‘alone together’ like this, each in front of the 2-dimensional image of the other, the raving characters became both more terrifying and more pitiful. 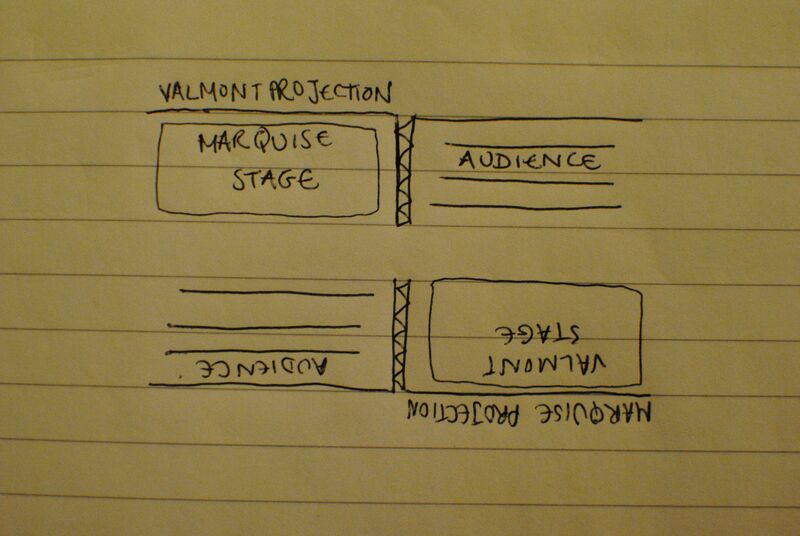 The video image was unfortunately never as sharp as the one in the striking press photo above, particularly when the actors weren’t up close to the camera – sitting with the Marquise, I didn’t know what Valmont’s face looked like until a little while through the play, when the two actors swapped stages. But what might have been lost in video quality was more than made up for by the sweaty frenzy of the actors as they spewed out Müller’s unstoppable cascade of text, sexual perversion on the brink of death. 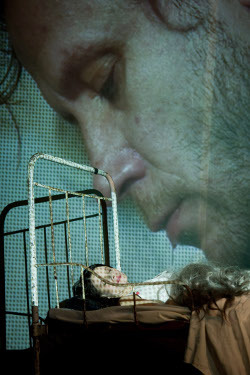 Unlike Verkommenes Ufer at the Deutsches Theater, this production wasn’t afraid to get seriously dirty. Just how Müller would have wanted it? I hope so.